This self-directed learning package is for use in conjunction with CPCRE's 'Guidelines for Syringe Driver Management in Palliative Care' and the SIMS Graseby® MS16A and MS26 syringe drivers. The learning package consists of the text and activities here on the website. It is designed to provide self-directed learning, and completion does not provide formal accreditation in this skill. The current learning package will be retained for those services/facilities still using the Graseby, which has largely been replaced by other devices. The information on this website is presented by the Centre for Palliative Care Research and Education (CPCRE) for the purpose of disseminating health information free of charge for the benefit of healthcare professionals. While CPCRE has exercised due care in ensuring the accuracy of the material contained on this website, the information on the site is made available on the basis that the CPCRE is not providing professional advice on a particular matter. This website is not a substitute for independent professional advice. CPCRE does not accept any liability for any injury, loss or damage incurred by use of or reliance on the information provided on this website. This package is intended to support clinicians to develop the knowledge of key principles in this field. It is expected that healthcare professionals would seek appropriate supervision and advice from experienced clinicians to ensure they have developed an appropriate level of clinical competence prior to caring for patients with these devices. Syringe drivers are power driven devices that drive the plunger of a syringe at an accurately controlled rate to deliver medications. Their use as a method of drug delivery to control palliative care symptoms is a common and accepted practice. They provide symptom control via infusion of drugs to treat pain and other distressing symptoms when other routes are inappropriate or ineffective. Many medications used in syringe drivers have narrow margins of error, so any errors that occur during prescription, preparation, administration or documentation of these infusions can result in serious adverse drug events and present an on-going risk for patient safety. Successfully completing this package will provide you with the beginning knowledge and principles to assist you to develop skills in using syringe drivers safely. The aim of this self-directed learning package is to assist you to develop knowledge and skills of the basic principles of care for patients with syringe driver devices. It is suggested you work through each section in turn. Read the information and the section of the guidelines recommended, before you proceed to the activities. After each activity, a series of questions will enable you to test your understanding. The answers to these questions and activities can be found by reading the 'Guidelines for Syringe Driver Management in Palliative Care' booklet available as a pdf document from this website. You may find it useful before taking the quiz to have access to relevant equipment such as a calculator, ruler, and if you wish, Terumo and BD syringes of various sizes, though you will find tables with syringe related information in the Guidelines. 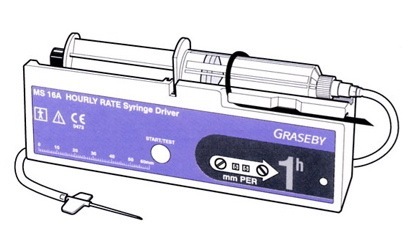 Safely monitor the patient with a syringe driver in situ.